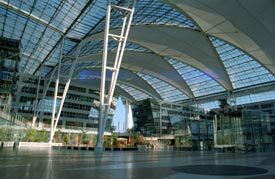 ABOVE: The Forum at Munich Airport Center is the largest covered open-air space in Europe, with 10,000 m� of area for lounging and special events. In warm weather, you can eat or drink in the outdoor beer garden. When Munich built a new international airport in the early 1990s, its founders tried something new: They added a shopping, dining, and services mall for both air travelers and the local community. Today, the mall--known as München Airport Center--attracts tourists and suburbanites from morning until evening, seven days a week. MAC begins in the central area of Terminal 1, a short distance on foot or by moving sidewalk from the airport's check-in counters and baggage claim. For a description of what it offers, continue to the next page or click the navigation links below.